These Initiatives assist families to ensure their children are healthy, have access to community resources, are developing appropriately, are engaged in language and literacy activities and attend high quality early care and education programs. Together, these Initiatives create a continuum of care prenatally through kindergarten entrance. Children that are ready for school have met milestones for social, physical, emotional, language and learning development. Through a collaborative partnership with the El Dorado County Office of Education, the Commission has defined “readiness” and has a tool to better understand if our incoming kindergarteners are developmentally ready for school. Through the Kindergarten Student Entrance Profile (KSEP), teachers use eleven areas of readiness to screen children within the first month of school. Data is collected through the use of iPads, eliminating the costs for manually recording data. In addition, Kindergarten teachers are using iPads in the classroom, familiarizing children with technology at a young age. 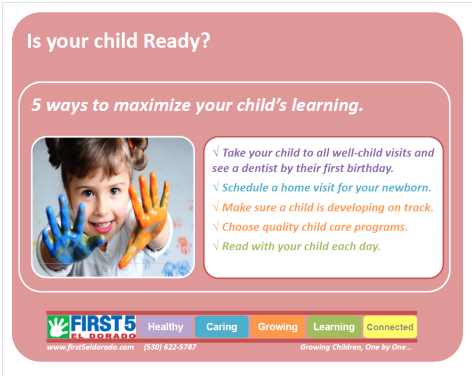 “Readiness” trends are used in developing semi-annual trainings for Kindergarten and early care and education teachers. Supplemental screens are included in the KSEP to target areas of weakness and develop a plan to support a child in their first year of school. The Children’s Health Initiative (CHI) has been successful in assisting families with young children in securing, obtaining, utilizing and maintaining health insurance coverage. In March 2011, the Agency for Healthcare Research and Quality recognized the CHI as an innovative practice in “County-Wide Collaborative Uses Pathways Model to Enhance Access to Insurance, Primary Care, and Mental Health Services for Low-Income Children”. Previously, the CHI was recognized by National Initiative for Healthcare Quality as an “Innovative Prevention program for Improving Children’s Healthcare in California” in June 2009. Building on this success, the CHI partnered with the County Office of Education and the Shingle Springs Tribal Health Program to expand oral health services for families receiving MediCal. The Children’s Dental Van travels to school sites providing services throughout the County. Families delivering newborn children at Marshall Medical Center and Barton Memorial Hospital are offered a home visit to support parents in the weeks following delivery. A Registered Nurse will follow up with families two to four weeks after delivery to conduct short health assessments for mom and baby and provide education, support and referrals as needed. Additional support for moms choosing to breastfeed is offered. Through this Initiative, parents are offered information about our community through a Child Health Record and a Kit for New Parents. The importance of healthy development is stressed and families are connected to Together We Grow to follow their baby’s progress. Families with newborn children delivering outside of El Dorado County are encouraged to attend a “Mother Goose on the Loose” session at their local library to connect with community services. 1100 Marshall Way 2170 South Ave. In the summer of 2011, First 5 El Dorado combined two successful Initiatives, Together We Grow and High 5 for Quality, to assure families have support for their child’s development regardless of their care at home or in an early care and education setting. Early Childhood Specialists support parents in using developmental screens to better understand their child’s development. Specialists are also trained on quality assessments to assist providers in delivering high quality early care and education services. Based on the outcomes of the screenings and assessments, parents and providers are offered information, referrals and support. An Inclusion Specialist is available to assist early care and education providers caring for children with special needs. Together, the Early Childhood and Inclusion Specialists will work with parents and providers to support children in meeting developmental milestones. The library has literacy activities for children of all ages. There are a variety of storytimes available. Families with children under the age of two can participate in “Mother Goose on the Loose” storytimes. Toddler Music storytimes are available for two to three year olds. A variety of preschool storytimes are available including “Let’s Read Together”, Spanish and bilingual storytimes, and weekly themed storytimes. The libraries are bringing the community to families by hosting “Family Place Library” and “Play to Grow” sessions. These multi‐week workshops provide opportunities to play and meet early childhood professionals and learn more about your child and community. For families with children in early care and education programs, library services are brought to the classroom including storytimes, activity packets for teachers and books to share. Community collaboration means that programs and providers work together so that children and families have seamless access to services and supports they need. 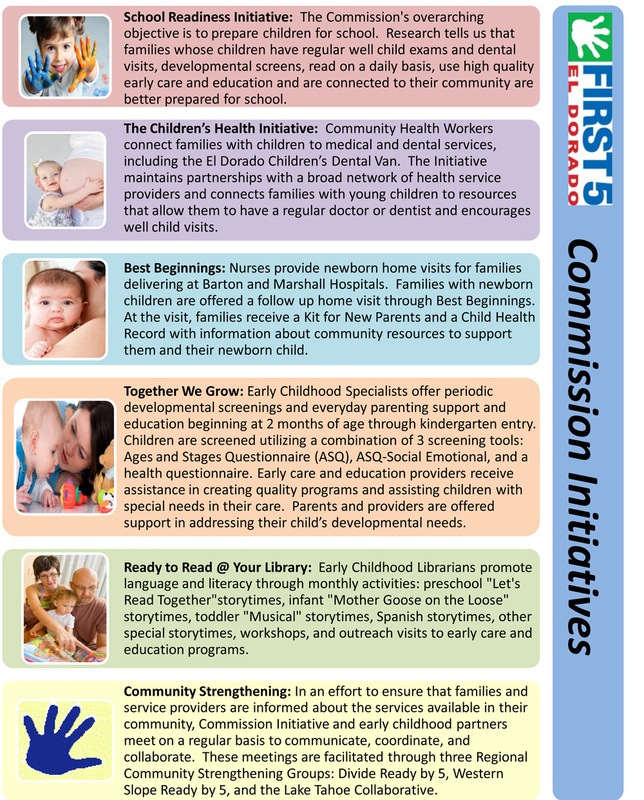 First 5 El Dorado engages community partners through Community Strengthening Groups in each region of the County to assess community needs and design outreach and promotion strategies that connect families to key services in their communities. In an effort to ensure that families and service providers are informed about the services available in their community, Commission Initiative and early childhood partners meet on a regular basis to communicate, coordinate, and collaborate. These meetings are facilitated through three Regional Community Strengthening Groups: Divide Ready by 5, Western Slope Ready by 5, and the Lake Tahoe Collaborative.